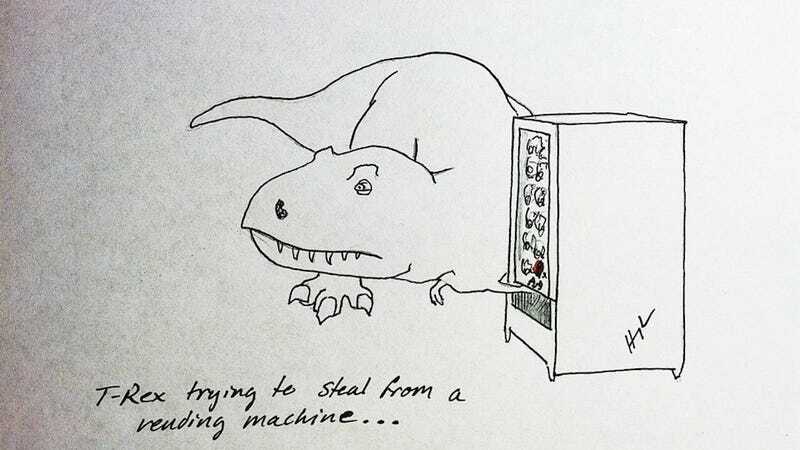 Pity the poor Tyrannosaurus. With those teeny little arms and that great big body, T-Rex is incapable of doing things that come easily to you and me. Hugh Murphy draws the series "T-Rex Trying..." which shows a T-Rex stuck in the modern age, trying (and usually failing) to do things no short-armed creature was ever meant to do: play tetherball, paint his house, win an auction, and work baggage loading at LAX. It makes me both sad for the T-Rex and grateful for the invention of the ukelele. I'll be shocked if "T-Rex Trying..." doesn't have a book deal by summer.